So, since I've been doing a lot of watercolor/sketching practice lately, I thought I'd make some fan art for yesterday's episode of Game of Thrones. I won't spoil it for you because I haven't even watched it yet. So, you're in the clear. 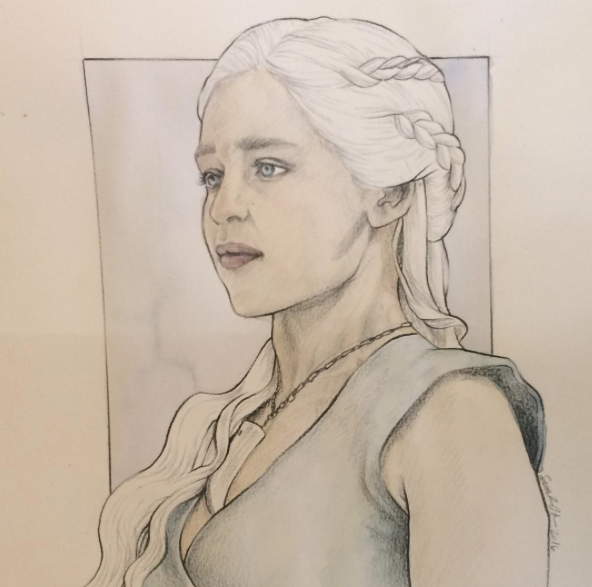 Today's image is a drawing I did of Daenarys Targaryen, the mother of dragons. This is, in fact, the second rendering of Emilia Clarke I've posted this month. She looks much different with all that white hair, right? The rectangle in the background is a little distorted because I stood the drawing up to take its photo. It's to actually curved like that. For this drawing I used black prismacolor pencil, watercolor pencils, and regular watercolors. Want to see what else I've been working on? Follow me on Instagram (@Jonezee85). Also! (And I'm going to remind you every day this week, probably) If you're in the Atlanta area this weekend, please stop by the Old Fourth Ward Arts Festival and say hello! I'll have a tent with my pop art portraits, but I'll also have a bin of sketches, prints, and watercolors, too. Put it on your calendar!